New Food Find and Meals with No Money! So in one of my previous posts, I talk about how amazing Trader Joe’s and Whole Foods Market is. 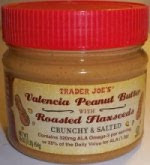 Trader Joe’s has this awesome peanut butter with 3 ingredients. Well, today I was getting a couple items at Target and saw that Archer Farms has the same one!!!! Amazingness. It was with flax seed and only 3 ingredients as well. Oh how I love Target….anyways, we were almost out of the PB from TJ so I picked it up. I have not tasted it yet so hopefully it scores well and I can buy that from now on. So here’s the situation. I have a big bag of chicken I cooked already and froze. I have a good amount of sliced ham too from Rise ‘n Roll Bakery (only $1 a pound!). Then Kyle’s mom left us with a ton, a ton of sloppy joe Elk meat from the weekend (garage sale). Do I really want sloppy joe’s every day for the next week? Nope, I sure don’t. So I decided to make empanadas with sloppy joe and ham. Yes I did. 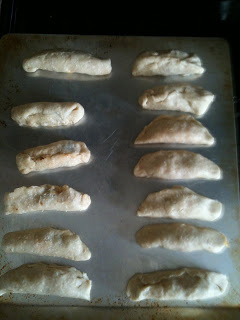 I just made the dough then put some cheese with choice of meat on the inside and folded it up. Fantastic! Then I froze the rest of the meat to use later (I love the freezer). Even though I don’t really have any room to buy groceries, it’s amazing what you can find in your cupboards to make that you normally buy!! I still buy no processed food but it’s easier not to make my own flatbread and such…so saving money here I am! I have things to say about my girl but don’t have time…so till the next post, see ya! Next PostMy girl…not so little anymore?